This year’s Newbery was announced not long ago, so I rushed to grab a copy of the new winner. I was rather disappointed. In fact, I haven’t really liked a Newbery winner since 2011, Clare VanderPool’s Moon Over Manifest. Perhaps all the edgier, more experimental types of literature like graphic novels and verse I’ve been seeing lately are leaving me in a bygone era. I don’t know. I just know I much prefer the old-fashioned literary novel. 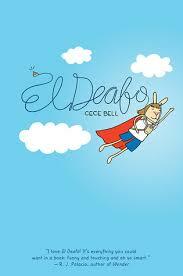 El Deafo is a graphic novel, 233 pages that took only 90 minutes to read, that tells the real-life story of author, Cece Bell. It is emotional, focusing on the feelings she experienced as she traversed grade school with an oversized, strap-across-her-chest hearing aid with cords that went up her ears. It shares the challenges she faced (kids speaking too slow and emphatic, staring, teasing) as well as the triumps. We get a pretty funny account of Cece acting as auditory lookout for the off-task classroom when her teacher, who wears a microphone, leaves the room. There is much that I related to, and much that I learned. However, I found the graphic format of the novel mildly obnoxious. The entire 233 pages are laid out like a never-ending comic strip, and the rabbit-people characters come off looking a little ridiculous. I know lots of kids take to graphic novels, and there are arguments to be made for the benefits they pose to low readers, but I just want to READ my books minus all the goofy drawings. The thing I disliked most, however, is that the pictoral format limited, in my opinion, the emotional output of the story. Bell has a very touching story to tell. She’s the odd one out, a child who’s longing for acceptance and friendship among her peers. But the simplified story failed to elicit much emotion in me, and the writing just isn’t very pretty. Dialogue bubbles don’t leave much room for artistry of that sort. The force of the message could have been amplified tenfold in a more traditional telling. So there you have it, my bias against graphic novels. I just don’t like them. At all. While this one was acclaimed all over the web last year, and I am sure there are kids out there somewhere with whom the story resonated, I’m having a hard time giving it much of a recommendation. I was surprised to see you review this book today. I have been trying to read the book and am half way through it. I agree that there is a lot of emotion and I think Cece wanted to write something that was humorous about her experience. A lot of kids like graphic novels. Like you, I really struggle with graphic novels, but I figured it’s because of my age. My daughter grew up wearing hearing aids and a FM system in the classroom, so I hoped that would draw me in. Sounds like you have some extra empathy with Cece’s story. It is a good one. I just think it could be so much more powerful in another format. I’d love, love, love to read it as a novel! Interesting. I usually have trouble with graphic novels but I really enjoyed this one. Maybe because I’ve been reading so many picture books lately. I grew up on comics, so graphic novels (and comics) hold a special place in my heart and I appreciate the story that the illustrations help tell – but that’s just me. 😉 I don’t like teen romances and I am sure some people somewhere (maybe) like them. Ms. Bell (and her husband, Tom Angleberger) is a nice lady (well, not Mr. Angleberger. He’s a nice GUY… 😉 ). You are exactly the demographic Ms. Bell was reaching out to, Erik. I’m just old. And too old for teen romances even though I just wrote one. (It’s much heavier on the history.) 🙂 I didn’t know she was married to Tom Angleberger!